Many Chronic Kidney Disease and Dialysis patients must contend with pain. In fact, more than 70% of patients have stated that they must deal with constant pain on a regular basis, suggested the Clinical Kidney Journal. It's a serious issue that patients sometimes do not fully understand and family and friends do not accept or empathize. Chronic Pain can lead to anger, frustration, depression, demoralization, strains to personal relationships, and an overall lower quality of life. 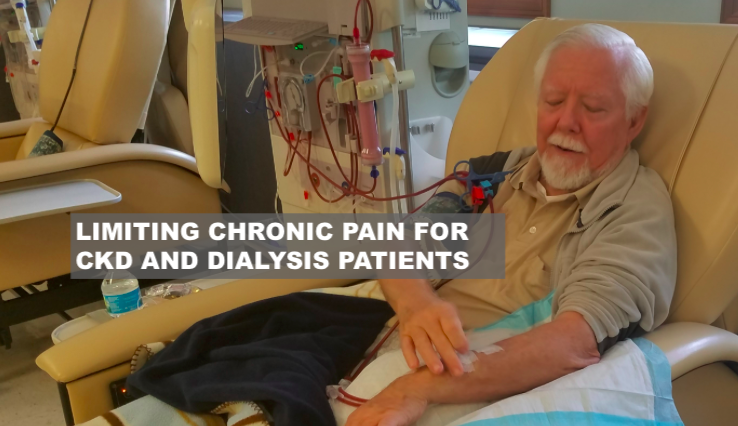 What's worse is that Chronic Kidney Disease and Dialysis patients that have Chronic Pain also have shown to have higher rates of mortality (death) than patients that have limited pain. Hence, take a look at the following new pain management tips to help improve your Chronic Pain while minimizing therapy-induced complications and addictions. Many Chronic Kidney Disease and Dialysis patients must contend with pain. In fact, more than 70% of patients have stated that they must deal with constant pain on a regular basis, suggested the Clinical Kidney Journal. It's a serious issue that patients sometimes do not fully understand and family and friends do not accept or empathize. Chronic Pain can lead to anger, frustration, depression, demoralization, strains to personal relationships, and an overall lower quality of life. What's worse is that Chronic Kidney Disease and Dialysis patients that have Chronic Pain also have higher rates of mortality (death) than patients that have limited pain. Hence, take a look at the following new pain management tips to help improve your Chronic Pain while minimizing therapy-induced complications and addictions. 1.) Understand that how you are feeling is normal. Many patients try to mask their pain and carry on with their day-to-day lives. This can lead to feelings of frustration, anxiety, and loneliness since a patient may feel like no one understands what they are dealing with. It's normal to feel angry when pain hinders you from activities you enjoy or the ability to lead a day that is not burdened by severe ache and discomfort. Let others know that you are in pain. Tell them where you are aching and let them know how it is making you feel. Now, they can be more empathetic to your situation and perhaps even find areas to help you in small ways throughout the day (cook, run errands, be quieter to allow you to rest or recover, offer to drive you to your destination, etc.). 2.) Attempt to monitor points of pain. Chronic Pain may not appear in the same location every time. One day it may be a joint pain in the toe. 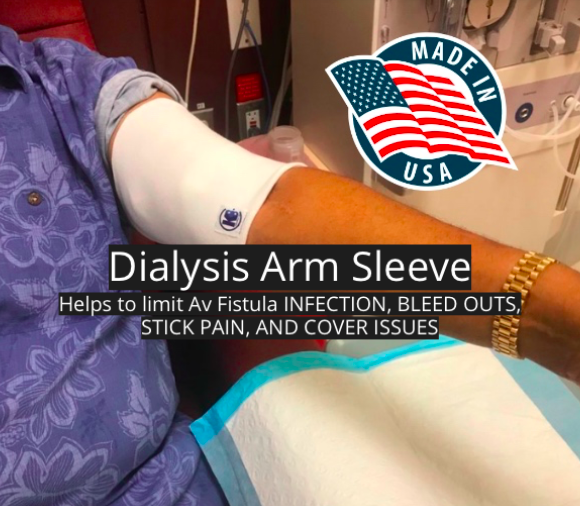 Another day your Dialysis Arm may ache. A third day you may have a pounding headache. You may experience crippling pain in the hands on the fourth day. It is important to know that you are not weak or a complainer. The pain is real and can be debilitating. Try to catalogue where you are experiencing extreme bouts of pain in a journal or on your phone. Perhaps there is a pattern that you can discuss with your Healthcare Team in order to identify a solution. 3.) Try your best to relax your nerves. Learning a relaxation technique to calm the body down can combat the stress and be used as needed for self-management. Techniques include progressive muscle relaxation, mindfulness, diaphragmatic breathing, guided imagery, yoga, and low-impact tai chi. "There isn't a secret formula or one 'right' or 'best' relaxation technique. You may have to experiment with several to find the one that works for you." noted Dr. Ted Jones. 4.) Do not over-do-it on the good days. Pace yourself on days when your Chronic Pain seems to have eased. When you feel good, it can be tempting to make up for lost time and engage in activities you may have missed, but be careful not to push your body too hard since this may lead to pain later that day or the next day. Try to break down larger tasks into smaller ones and take your time. 5.) Try to distract yourself. While distraction won't reduce your pain, it can transport you to a place where the pain isn't the prominent thought in your head. “Letting the patient see and feel the power of distraction from his or her own pain can be very powerful,” said Dr. Jones. One study found that playing video games is effective, but other activities, such as knitting, coloring books or crossword puzzles, can be a means of keeping your mind occupied with something else. Texting, watching your favorite movie, talking to family and friends, playing with your pet, and reading a good novel are also beneficial distractions. 6.) You can try a dietary approach. In the fight against pain from inflammation, your diet can be an effective weapon, suggested Susan McQuillan (MS, RDN, CDN). Modifying your diet to routinely include anti-inflammatory foods is a more natural way to try to help ease pain and perhaps avoid some of the potential side effects of high doses of medication. Omega-3 fatty acids—a type of fat found in oily fish such as salmon and tuna—are known to reduce inflammation, particularly in people with rheumatoid arthritis and non-rheumatoid arthritis joint pain and stiffness. 7.) Discuss concerns about prescribed pain medication with your Nephrologist. Ultimately, you should discuss your constant pain and options for solutions with your Healthcare Team. Many patients try not to ever take strong painkillers prescribed for fear of addiction. While this is understandable, by drawing your addiction concerns to the attention of your Nephrologist it should allow them to recommend amounts or medications that are less likely to cause addiction while helping to correct your Chronic Pain. How do you manage your Chronic Pain? Share your experience and insights with the over 71,000 Friends who have liked KidneyBuzz.com on Facebook (click here). Also, follow the over 250,000+ monthly individual viewers who visit KidneyBuzz.com regularly for the latest daily news and information which teach those with Chronic Kidney Disease, Dialysis, Kidney Transplant, Diabetes, and Hypertension how to better manage and improve their lives. Erica Ashley Jenkins (Dialysis Nurse) said, "Hello I just wanted to let you know I work in a dialysis clinic and over half of our clinic reads this page, we enjoy everything you put on and love to have new information. My patients are very grateful."